Serve up the lettuces of the season, like chard, kale, and spinach, fresh sweetened with butternut squash and berries for a salad loaded with the vitamin goods. Toss the diced butternut squash in a light drizzle of olive oil and a pinch each of salt and pepper. Spread in a single layer on a baking sheet and roast at 450F for 8-10 minutes or until fork tender and lightly browned. Set aside and cool completely. In a small bowl, whisk together the ingredients for the Vinaigrette. 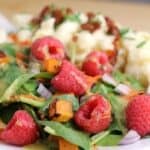 To assemble the salad, on each of 4 plates layer in the following order: salad greens, carrot, onion, roasted butternut squash, and raspberries. Drizzle vinaigrette over top and serve. Yields 4 servings. If good, fresh raspberries are not available, substitute with 1/4 cup dried cranberries.